Crude oil basis risk is receding… for now. Companies that hedge oil prices have been forced to reevaluate their strategies over the last couple of years. Many companies have used the NYMEX WTI contract, one of the oldest energy futures contracts and still one of the most liquid. The WTI contract is for oil delivered into Cushing, Oklahoma, but since crude oil is a global commodity and transportation links have historically been good, fluctuations in the WTI price have been a reasonable benchmark for global supply and demand. However, in the last few years, the differential between WTI and Brent, the other leading global benchmark, have exploded and been very volatile. Suddenly, geography made a great deal of difference. Technology has opened up new production in North America, first from the Canadian oil sands and more recently from US tight oil fields. A bottleneck in the capacity of pipelines for shipping production out of Oklahoma down to the US Gulf Coast meant that the central US experienced a glut of supply, disconnecting the regional price from the global one. This has meant that fluctuations in NYMEX’s WTI futures price reflected local variations in demand and supply that did not necessarily track variations in global supply and demand and global crude price. Hedgers not located in the central US faced increasing basis risk in using the WTI contract. Some switched to using the ICE Brent contract instead. Others adjusted their hedge ratios. These events have been a key feature of the recent marketing duels between NYMEX and ICE over which contract is best. A number of actions have been taken to address the transportation bottleneck. In 2012, flow on the Seaway pipeline that was designed to move oil from the Gulf up to Cushing was reversed. Work on a project to triple capacity on the Seaway has just been completed and additional oil flowed last week. More projects are on the way. These include the southern portion of the Keystone XL pipeline and the Longhorn pipeline. And in the meantime, railroads have been expanding their capacity to ship the supplies—an expensive but still helpful alternative. Back in November, when the basis was at $21, futures prices indicated the basis would decline. 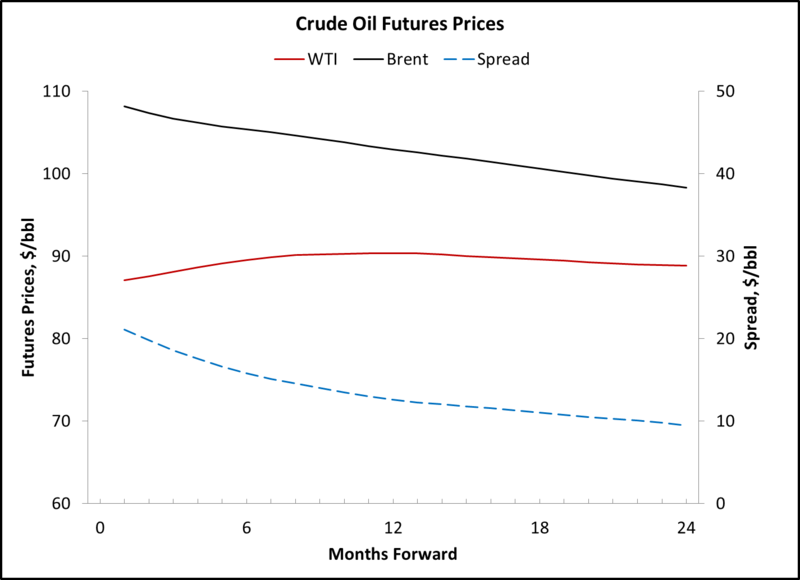 The WTI price exhibited a curious “hump”, with the near months being in contango, but the long maturity contracts being backwardated. 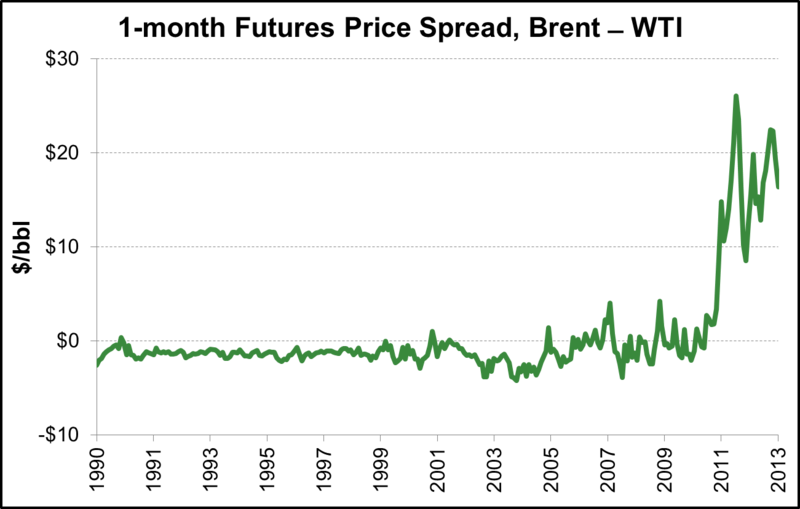 The near month prices were dominated by a reversion to the Brent price curve. And, as it turns out, the basis has declined. As of yesterday, it stood at $16. Will this continue? Will the WTI become once again a reliable benchmark for global trade. The global understanding of tight oil and shale gas potential is still evolving, however, and the range of external forecasts reflects the uncertain landscape. Different views on the North American resource base – in particular, whether to expect further growth – are the key factor behind the range of external forecasts. This entry was written by John Parsons, posted on January 17, 2013 at 5:59 pm, filed under commodities, hedging, markets, packaging risk, volatility. Bookmark the permalink. Follow any comments here with the RSS feed for this post. Post a comment or leave a trackback: Trackback URL.